Tech N9ne Reaches A ‘Boiling Point’ With Third-Consecutive Top 3 Rap Release In 2012! Darkness reigns on the charts as Tech N9ne racks up his third-consecutive top 3 Rap release of 2012 with the Boiling Point EP. Already considered one of the darkest entries into the K.O.D. 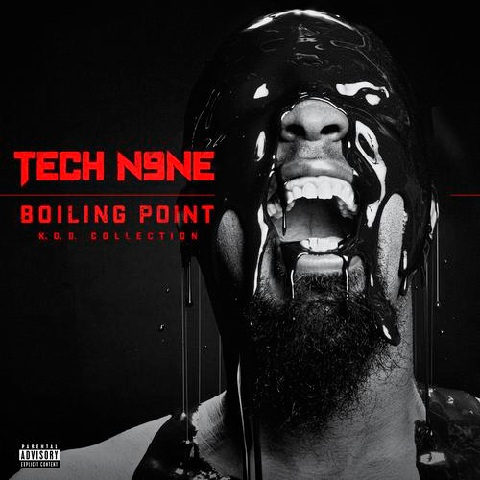 Collection, Boiling Point was envisioned as Tech N9ne’s sinister follow-up to E.B.A.H., which was released earlier this fall. Boasting guest spots from Brotha Lynch Hung, Krizz Kaliko, Aqualeo, Bishop, and Smackola, the EP also included the livewire single, “URALYA”. After shooting up the iTunes charts, the EP has officially earned its first-week sales impressions, which include top five spots on the Rap, R&B, and Indie charts. Third time’s a charm for the self-proclaimed KLUSTERFUK. Check out the complete rundown of Boiling Point‘s first week! What do you think about Boiling Point’s success so far? Give us a shout in the comments section below!